Best experience had in Japan: above places and having fun with new friends. Consider making Anime Japan optional add on. I personally did not get much out of it, especially for the hours in line. Would have preferred the option of an extra free day. It had all basic amenities despite being small. the pre-arranged meals were good and gave some nice taste of Japan. They were well in formed, fun , and very nice people. 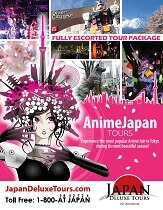 excellent variety of hotspots, both anime related, and Japanese cultural.